Discover Dili’s small-town vibe with its unique Portuguese influence. Relax as you cruise the tropical waters of South East Asia. Enjoy the on board facilities like the pool areas and health spa. 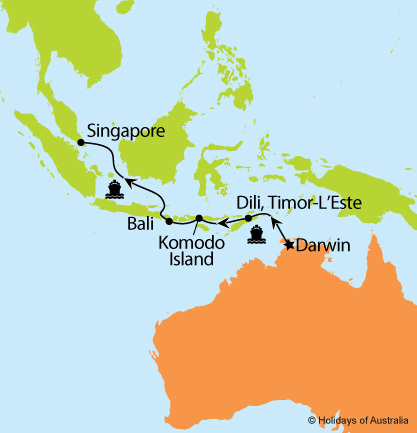 8 nights aboard Pacific Dawn cruising from Darwin to Singapore with port calls in Dili (Timor-Leste), Komodo Island (Indonesia) & Bali (Indonesia). Includes on board meals & entertainment.